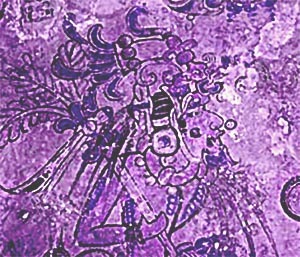 Hundreds of years before the birth of Christ, a thousand years before the 13th century Dresden Codex and the 16th century Popol Vul, hundreds of ancient chambers were sealed in the lands we now know as the Maya lands. These chambers were constructed in a profoundly sacred manner. Their purpose was beyond what we can conceive at this time. These chambers were sealed to lock in certain information and alchemical energy. Once a sacred seal was broken in any one of these chambers, the energy locked inside would be released into the world. All of this was meticulously planned out. The ancient ones did all of this for us who live in this time. One such chamber has been opened. Although there are hundreds of such chambers throughout the Maya lands, this one has particular significance to the transformational times humanity is upon. We are in the last days of a 104 thousand year cycle. This chamber held the knowledge of Four Worlds; Four Worlds of 104 thousand years each. The last of these Four Worlds is the one we are presently in. In this chamber there is a hint of the Fifth World that we are at the brink of entering. It hints at how we get to the Fifth World, and what we might expect when we get there. This chamber lies deep in the jungles of Peten, Guatemala in a Maya site called San Bartolo. It has been reopened. We don't know exactly when the seal was cracked. It is possible that it was opened as early as the year 2001 by grave robbers. They didn't understand the significance of the chamber that they hammered into; they were only looking for treasure . . . for jade. Little did they know that the treasure was not in the material objects that they were hoping to find. The treasure was the energy. The echo of this energy, this truth, is in the remains of magnificent murals. These are considered the oldest Maya murals to be uncovered to date. What they left behind for us to uncover would trigger a great mystery and a wave of controversy. They left clues in artful murals. These clues were left behind in a way that they hoped we would understand within the level of consciousness that we would have at the time the seals were broken. The only way to convey these messages of personal mastery and ascension was through imagery that we could relate to. At the time they sealed the chambers, over 2000 years ago, we were hanging people on crosses to die. We were killing people in the name of God. Only the elite could read text. There was mass fear, confusion, greed, war, mind control and overwhelming superstitions. These regrettable actions are still taking place today and ruling the 4th world. The advanced people who anchored this energy were not savages, and nor were they un-evolved. The 4th world has yet to understand the elegance and sophistication of these people and their level of consciousness. They were far more advanced than we can understand at this time. Unfortunately modern archeology has jumped to all the wrong conclusions regarding most Maya Art. Archeology experts suggest that the ones who sealed the chambers were bloody sacrificial savages and warring cannibals. Researchers read the murals as a recording of history instead of a type of letter that we could read today. Archeology is not a science; nor is it history. It is assumptions! And the assumptions are wrong. The mass media and academic worlds want to you believe these wrong assumptions. Because within the clues that they left behind are keys to becoming free of the entrapments of the Forth World on all levels. When you are set free, the powers in your world can no long control you, or feed off of your energy any longer. The murals in San Bartolo are a brief history of your past worlds and an echo of the 5th world that is just in front of you. Most history you do not need to remember. What is most important for you to remember is that you always evolve, and you WILL enter into the Fifth World. This is the Prophecy of the Fifth World. A Brief History of the 4 Worlds . . . The First World was a world of solely the consciousness of the mineral Kingdom. It was a world directed by the guardians of the EAST, the color of RED, and the Element of Water. It was a silent gestation time. The Earth was mostly molten lava. Crystals were beginning to form in the Earth's crust. Nothing moved, since it was timeless and spaceless. There was only a recording of the blue print of life. Some of the crystals you have today still maintain the encoding of this Blueprint of Life. Some of you even know and feel this. The Second World was the Kingdom of Plants and Minerals together. It was a world directed by the guardians of the NORTH, the color of WHITE, and the Element of Air. It was the wisdom of the blueprint put into action and the dimension of time. Algae began to grow and evolved into various plants. Time was born, and cycles of life and death began. You could feel life bursting forth and falling away. Some plants evolved from the minerals that had the Blueprint of Life encoded within them. Some of you still ingest these plants to help you remember. The Third World was the Kingdom of Animals, Plants and Minerals together. It was a world directed by the guardians of the WEST, the color of DARK BLUE, and the Element of EARTH. Animals gained the ability to move about their environment, and dimension of space was born and linked with time within the blueprint. The world of the animals was instinctual. Animals knew how to thrive, but didn't know how to manipulate their environment. They lived with nature and in the present. All was acted upon instinctually based on the encoding in the blueprint. This world was the wisdom of the blueprint put into time and space with instinct. Some animals still carry the power of this blueprint. Many of you are still called to certain animal totems for this reason. The Fourth World is the world of Human Beings, Animals, Plants and Minerals together. It is a world directed by the guardians of the SOUTH, the color of YELLOW, and the Element of FIRE. This world was the wisdom of the blueprint put into time, space, instinct , but also consciousness. Animals evolved into Human Beings and began to gain the ability to change their environment. The Human Being could envision and plan for the future and learned to manipulate the blueprint. Humanity took its first steps in being a consciousness beings with creative powers. They learned how to alter the Blueprint. Humanity considered itself master of all worlds without respect for earlier worlds. Manipulating the blueprint caused many problems. It created Karma based on the manipulations that caused harm. Human beings have misused minerals, plants and animals. Also, guilt, fear, greed, lust, gluttony, laziness and hate were born. The seven deadly egos. The Fourth world is a world of creative force. Star seeding took place in this world to help to raise the consciousness of the human being. Many of you still remember you are from the Stars. Now, at the end of this World . . . using minerals, plants or animals to evolve the path of the human consciousness is not effective. Using force is having terribly consequences. Yet this is the highest form of the blue print as of now . . . . but there is another step. The Murals Speak . . .
Each world is marked by a tree of life: "The Wacah Chan". Each world is 104 thousand years long. Each world has an archetype, program, or laws of nature that master that world. At the end of each world, a sacrifice of life was made. The life of that world has to let go to evolve to the next world. In the San Bartolo Mural, the ancient ones are telling us about being reborn into a new world. Researchers saw the images as a recording of ego centered history and sacrifice; not a letter of prophecy to mankind from ones from the future. In native stories, there is a tale of the Eagle's rebirth. The Eagle can live to 70 or 80 years old. But half way through its life, it has a crisis. It's beak and talons have grown too long to allow it to hunt or to eat. It's wing feathers have grown to heavy to fly. The eagle has a choice to either be reborn or to die. If it chooses to be reborn, the Eagle takes its last flight to the mountains and finds a cave. While hiding from the world in the cave, the Eagle sands down its beak on a rock. It pulls out its talons and heavy over-grown feathers. It is a very painful process. Months later, the Eagle's beak has healed, the talons have grown back, and new flight feathers have re-grown. The Eagle has now been re-born and entered a new life. For Humanity to enter a new world is very much like the Eagle being reborn. We must die to our old ways, our old programs and belief systems to enter a new world . . . otherwise we just impose obsolete laws of nature upon a new higher world. It is just like a virus. Being re-born is not a comfortable process, as all are asked to let go of what they know, and to trust that something better will take its place. It will be a time to give up and let the transformation take place. Just as the caterpillar will turn into the butterfly, and a pearl will grow from the grain of sand inside the oyster, humanity will be reborn into a new world . . . the Fifth World. It is time for great patience, trust, and understanding, so we can allow our new feathers to grow back in a new way. The Prophecy of the Fifth World . . . The Prophecy of the Fifth World is yet to manifest. But when the ancients ones looked ahead, this is what they can share that we can understand at this time. The Four Worlds, that we are moving from, were all on the same level of time, space and dimension. The Fifth world is a step above previous worlds and marks an enormous transformation that we have ever experienced in the first four worlds. The Fifth World will be a blending and harmonization of all four worlds, but taken to a different level. These four worlds together, in a cosmic equality, will bring about a new kind of life. Mineral, plant, animal and human will be looked at as being equally alive. There will be a type of intelligent communication between each world. The ancient ones know that it is hard for us to imagine this right now. In the Fifth World, it will not be part of the blueprint to use and abuse the mineral worlds any longer. Mining for gold and silver, or other Earth based resources, will stop. We will not wear gems for vanity, but for the energy and out of great respect. We will recognize the Mineral Kingdom as living beings, way beyond what we do now. In the Fifth world, it will not be part of the blueprint to use and abuse the Plant Kingdom either. Logging forests for out of control building, produce grown with pesticides and other uncountable abuses will not be part of the Fifth World blueprint. We will recognize plants as living beings, just as much we are living beings! There will be honor in earth gardening and taking care of the plants of the world. In the Fifth world, it will not be part of the blueprint to use and abuse the Animal Kingdom either. Caring for the animals of the Earth will be just as important as caring for our children. We will not see a difference between animals and humans as we do now, even though we are all mammals in the Fourth World. In the Fifth world, the new life will not use other kingdoms to manifest what they want or need. More over, it is a symbiotic relationship or type of cooperation between the four world life types to create what is needed. A lot of what the Fifth World will be for us, we can't conceive as yet. But as time grows closer to the unveiling the pearl of the Fifth World, the clearer it will become. Most important . . . when the Human Kingdom leaves the Fourth World, it will leave the world of force behind. The four integrated worlds will enter the cosmic law of Gravitation. Gravitation is one of the laws of the Fifth World. Life will not manifest by force in order to make something happen. The new life will use gravitation or allowance for manifesting. People will not pray or affirm things into being, but instead assume it is so . . . and allow it to gravitate to them. This is Fifth World Alchemy. Some of you are already living this way. There were some ancient civilizations that did live a similar form of this Fifth World for brief times upon the planet. They did this to anchor the possibility for the future of the Fifth World. It is like if you didn't know what chocolate tasted like, how could you explain it? The lands you call Atlantis (most of which is now under the sea except for Santorini in Greece, and the Bahamas in the Caribbean), the Peruvian Andes and some places in the Himalayas are some of the places the ancient ones anchored the memory or, should we say, lived the prophecy of the Fifth World. Many of you are drawn to these places for mysterious reasons. Know you know why! They are many of you out there that this message will speak very loudly to. You are the ones that could never understand why the world is the way it is. You may have never felt at home. You also might have felt that you hid secret knowledge somewhere that you have yet to uncover. You feel soul tired. If you know this in your heart, you are one of these ancient ones who have come back from the future to this important time . . . you are the ones who have come back to reawaken the blueprint of the Fifth World. Some Responses . . .
Honderden jaren voor de geboorte van Christus, een goede duizend jaar voor de 13e eeuwse Dresden Codex en de 16e eeuwse Popol Vul, werden honderden oude kamers verzegeld in de landen die we nu kennen als Maya landen. Deze kamers waren geconstrueerd op een zeer bijzondere en heilige manier. Hun doel was gericht boven wat we nu kunnen bevatten. Deze kamers werden verzegeld om bepaalde informatie en alchemische energie af te sluiten. Als eenmaal een heilig zegel verbroken werd van een van deze kamers, zou de energie die erin opgesloten was vrijgelaten worden in de wereld. Dit alles werd zorgvuldig gepland. De Ouderen deden dit alles voor ons die in deze tijd leven. Een van die kamers is nu geopend. Hoewel er honderden van deze kamers zijn verspreid over de Maya landen, heeft deze een bijzondere betekenis voor de transformatie tijd waar de mensheid nu in zit. Wij zijn in de laatste dagen van een 104 duizend jaar lange cyclus. Deze kamer bevatte de kennis van Vier Werelden van 104 duizend jaar elk. De laatste van deze Vier Werelden is degene waar we ons op dit moment in bevinden. In deze kamer bevind zich een hint voor de Vijfde Wereld waarvan we nu op de drempel staan. De hint gaat over hoe we in de Vijfde Wereld komen, en wat me kunnen verwachten als we daar zijn. Deze kamer lag diep in de jungle van Peten, Guatamala in een Maya site genaamd San Bartolo. Het is heropend. We weten niet precies wanneer de zegel verbroken was. Het is mogelijk dat het al in 2001 geopend was door graf rovers. Zij begrepen niet de belangrijkheid van de kamer waar zij in braken; zij waren alleen maar op zoek naar schatten, naar jade. Weinig wisten zij van de werkelijke schat, die was niet in de materiele objecten die zij hoopten te vinden. De werkelijke schat was de energie. De echo van deze energie, deze waarheid, is te vinden in de overblijfselen van de prachtige muurschilderingen. Deze worden beschouwd als de oudste Maya muurschilderingen die ooit ontdekt zijn. Wat zij achterlieten voor ons om te ontdekken zou een groot mysterie oproepen en een golf van tegenstellingen. Zij lieten aanwijzingen achter in kunstige muurschilderingen. Deze aanwijzingen lieten ze achter op zo een manier dat ze hoopten dat we ze zouden begrijpen met het niveau van bewustzijn dat we zouden hebben op het tijdstip dat de zegels gebroken werden. De enige manier om deze boodschappen over persoonlijk meesterschap en ascensie over te brengen was door middel van beelden waar we ons aan konden spiegelen. In de tijd dat ze deze kamers verzegelden, meer dan 2000 jaar geleden, hingen wij mensen aan kruizen om te sterven. We vermoordden mensen in de naam van God. Alleen de elite kon tekst lezen. Er was massaal angst, verwarring, hebzucht, oorlog, controle en bijgeloof. Deze betreurenswaardige praktijken vinden vandaag nog plaats en beheersen de 4e wereld. De geavanceerde mensen die deze energie verankerden waren geen wilden, en ook waren zij zeer betrokken. De 4e wereld moet nog de elegantie en ontwikkeling van deze mensen en hun bewustzijnsniveau gaan begrijpen. Zij waren zeer veel meer geavanceerd dan we nu kunnen begrijpen. Helaas heeft de moderne archeologie geheel verkeerde conclusies getrokken over de meeste Maya kunst. Archeologie experts suggereren dat de kamers verzegeld waren door wilden en kannibalen die bloedoffers brachten. Onderzoekers lezen de muurschilderingen als een soort van geschiedkundig geschrift net als we tegenwoordig een boek lezen. Archeologie is geen wetenschap, en ook is het geen geschiedenis. Het zijn aannames! En de aannames zijn fout! De massa media en de academische werelden willen dat jij deze foute aannames gelooft. Omdat in de aanwijzingen die zij achtergelaten hebben zich de sleutels bevinden die ons vrij kunnen maken van de gevangenschap in de 4e Wereld op alle niveaus. En als je vrij bent, dan kunnen de machten in de wereld je niet langer controleren, of zich voeden van jouw energie. De muurschilderingen in San Bartolo zijn een korte geschiedschrijving van jouw vorige werelden en een echo van de 5e wereld die net voor je ligt. De meeste geschiedenis hoef je je niet te herinneren. Wat het allerbelangrijkste voor jou is om je te herinneren is dat je altijd evolueert, en dat je de Vijfde wereld binnen ZAL gaan. Dit is de profetie van de Vijfde Wereld. De Eerste Wereld was een wereld met het bewustzijn van het mineralen rijk. Het was een wereld die bestuurd werd door de wachters van het OOSTEN, de kleur ROOD, en het element WATER. Het was een stille tijd. De Aarde bestond grotendeels uit gesmolten lava. Kristallen begonnen zich te vormen in de Aardkorst. Niets bewoog, omdat het tijdloos en ruimteloos was. Er was alleen een vastleggen van de blauwdruk voor leven. Sommige van de kristallen die je vandaag hebt bevatten nog steeds de code voor deze blauwdruk van het leven. Sommigen van jullie weten en voelen dit. De Tweede Wereld was het rijk van Planten en Mineralen samen. Het was een wereld die bestuurd werd door de wachters van het NOORDEN, de kleur WIT, en het element LUCHT. Het was de wijsheid van de blauwdruk die in actie gekomen was en de dimensie tijd. Algen begonnen te groeien en evolueerden naar allerlei planten. Tijd was geboren, en de cyclus van leven en dood begon. Je kon het leven voelen uitbarsten en dan weer wegvallen. Sommige planten evolueerden vanuit de mineralen die de blauwdrukken van het leven in zich gecodeerd hadden. Sommige van jullie nemen deze planten in om je te helpen herinneren. De Derde Wereld was het rijk van Dieren, Planten en Mineralen samen. Het was een wereld die bestuurd werd door de wachters van het WESTEN, de kleur DONKER BLAUW, en het element AARDE. Dieren kregen het vermogen om zich door hun omgeving te bewegen, en de dimensie ruimte werd geboren en vastgeknoopt aan de tijd in de blauwdruk. De wereld van dieren was instinctief. Dieren wisten hoe ze moesten voortbestaan, maar ze wisten niet hoe ze hun omgeving moesten manipuleren. Zij leefden met de natuur en in het heden. Alles werd instinctief gedaan gebaseerd op de codering van de blauwdruk. De wereld was de wijsheid van de blauwdruk in de tijd en ruimte gezet met instinct. Sommige dieren dragen nog steeds de macht van de blauwdruk. Velen van jullie roepen nog steeds dieren totems aan om die reden. De Vierde Wereld is de wereld van Mensen, Dieren, Planten en Mineralen samen. Het is een wereld die bestuurd wordt door de wachters van het ZUIDEN, de kleur is GEEL, en het element is VUUR. Deze wereld was de wijsheid van de blauwdruk in de tijd en ruimte gezet met instinct, maar ook met bewustzijn. Dieren evolueerden in Mensen en begonnen het vermogen te krijgen om hun omgeving te veranderen. De Mens kon een plan bedenken voor de toekomst en leerde om de blauwdruk te manipuleren. De mensheid nam zijn eerste stappen om bewuste wezens te worden met creatieve krachten. Zij leerden hoe ze de Blauwdruk moesten veranderen. De Mens beschouwde zichzelf als meester van zijn werelden zonder respect voor de eerdere werelden. Het manipuleren van de blauwdruk veroorzaakte veel problemen. Het cre�erde karma gebaseerd op de manipulaties en dat veroorzaakte leed. Mensen misbruikten mineralen, planten en dieren. Ook werden schuld, angst, hebzucht, verlangen, afgunst, luiheid en haat geboren. De zeven dodelijke ego's. De Vierde Wereld is een wereld van creatieve kracht. Sterrezaden verschenen in deze wereld om te helpen met het verhogen van het bewustzijn van de mens. Velen van jullie herinneren je dat je van de sterren afkomstig bent. Nu, aan het eind van deze Wereld.....het gebruiken van mineralen, planten en dieren om het pad van het menselijk bewustzijn te evolueren is niet effectief. Kracht gebruiken heeft verschrikkelijke consequenties. Toch is dit de hoogste vorm van de blauwdruk tot nog toe....maar er is een volgende stap. Elke wereld wordt gemarkeerd door een levensboom: "De Wacah Chan". Een wereld is 104 duizend jaar lang. Elke wereld heeft een archetype, programma, of natuurwet die die wereld beheerst. Op het eind van elke wereld, wordt een offer van leven gepleegd. Het leven van die wereld moet gaan om te evolueren naar de volgende wereld. In de San Bartolo Muurschilderingen, vertellen de ouderen ons over het opnieuw geboren worden in een Nieuwe Wereld. Onderzoekers zagen de beelden als een opname van ego gecentreerde geschiedenis en offering; niet als boodschap van profetie voor de mensheid vanuit de toekomst. In oude verhalen, is er het verhaal van de wedergeboorte van de Adelaar. De Adelaar kan 70 tot 80 jaar oud worden. Maar halverwege zij leven, heeft hij een crisis. Zijn bek en klauwen zijn te lang geworden om nog te jagen of te eten. Zijn vleugelveren zijn te zwaar geworden om nog te vliegen. De Adelaar heeft een keuze om of wedergeboren te worden of om te sterven. Als het kiest om wedergeboren te worden, dan vliegt de Adelaar op zijn laatste vlucht naar de bergen en vindt hij een grot. En terwijl hij zich voor de wereld verbergt in zijn grot, schuurt de Adelaar zijn bek op de rotsen. Hij trekt zijn klauwnagels en te zware veren eruit. Dat is een zeer pijnlijk proces. Maanden later is de bek van de Adelaar weer geheeld, zijn de klauwnagels weer teruggegroeid, en zijn de nieuwe veren zijn weer op lengte. De Adelaar is nu opnieuw geboren en begint aan een nieuw leven. Voor de Mensheid lijkt het om de nieuwe wereld binnen te gaan veel op het opnieuw geboren worden van de Adelaar. Wij moeten onze oude manieren laten afsterven, en onze oude programma's en overtuigingen loslaten voordat we de nieuwe wereld in kunnen gaan....anders proberen we met verouderde natuurwetten de nieuwe wereld in te gaan. Het is net als een virus. Opnieuw geboren worden is niet een comfortabel proces, omdat we allemaal gevraagd worden om alles los te laten wat we weten, en om te vertrouwen dat iets beters daarvoor in de plaats gaat komen. Het zal een tijd worden van opgeven en de transformatie plaats laten vinden. Net als de rups die in een vlinder zal veranderen, en een parel zal groeien uit een zandkorrel in een oester, zal de mensheid herboren worden in een nieuwe wereld.....de Vijfde Wereld. Het is tijd voor veel geduld, vertrouwen en begrip, zodat we onze nieuwe veren kunnen laten groeien op een nieuwe manier. De Profetie van de Vijfde Wereld moet zich nog manifesteren. Maar als de Ouderen vooruit kijken, is dit wat zij willen delen met ons en wat we op dit moment kunnen begrijpen. De Vier Werelden, die we gaan verlaten, waren allemaal in hetzelfde begrip van tijd, ruimte en dimensie. De Vijfde Wereld is een stap voorbij de voorgaande werelden en markeert een enorme transformatie die we nog nooit ervaren hebben in de eerste vier werelden. De Vijfde Wereld zal een mengen en harmoniseren van alle vier de werelden zijn, maar op een ander niveau. Deze vier werelden samen, in een kosmische eenheid, zullen een nieuw soort van leven voortbrengen. Mineraal, plant, dier en mens zullen beschouwd worden als gelijkwaardig leven. Er zal een soort van intelligente communicatie zijn tussen elke wereld. De ouderen weten dat het moeilijk voor ons is om ons dit nu voor te stellen. In de Vijfde Wereld, is het geen onderdeel van de blauwdruk meer om het mineralenrijk te gebruiken en misbruiken. Delven naar goud en zilver, of andere op Aarde gebaseerde middelen zal stoppen. We zullen geen juwelen meer dragen uit ijdelheid, maar voor de energie en uit groot respect. We zullen het mineralen rijk beschouwen als levende wezens, ver voorbij wat we nu doen. In de Vijfde Wereld, zal het ook geen onderdeel meer zijn van blauwdruk om het plantenrijk te gebruiken of te misbruiken. Het kappen van bossen voor al die gebouwen, het produceren van groen met pesticiden en andere talloze misbruiken zal geen deel meer uitmaken van de blauwdruk van de Vijfde Wereld. We zullen erkennen dat planten levende wezens zijn, net zo als wij levende wezens zijn! Het zal eervol zijn om in de aarde te tuinieren en te zorgen voor de planten van de wereld. In de Vijfde Wereld, zal het ook geen onderdeel meer van de blauwdruk zijn om het dierenrijk te gebruiken en te misbruiken. Zorgen voor de dieren van de Aarde zal net zo belangrijk zijn als zorgen voor onze kinderen. We zullen geen verschil meer zien tussen dieren en mensen zoals we dat nu doen, zelfs ondanks dat we allemaal zoogdieren zijn in de Vierde Wereld. In de Vijfde Wereld, zal het nieuwe leven niet andere rijken gebruiken om te manifesteren wat zij willen of nodig hebben. Veel meer wordt het een symbiotische relatie of soort van samenwerking tussen de vier wereld types van leven om te cre�ren wat er nodig is. Veel van wat de Vijfde Wereld voor ons zal zijn, kunnen we nu nog niet begrijpen. Maar als de tijd naderbij komt om meer van parel van de Vijfde Wereld te onthullen, dan zal het steeds duidelijker worden. En het allerbelangrijkste.....als de mensheid de Vierde Wereld verlaat, zal het de wereld van kracht achterlaten. De vier ge�ntegreerde werelden zullen de kosmische wet van Aantrekkingskracht binnengaan. Aantrekkingskracht is een van de wetten van de Vijfde Wereld. Het leven zal niet manifesteren door kracht om iets te laten gebeuren. Het nieuwe leven zal aantrekkingskracht en toestaan gebruiken om te manifesteren. Mensen zullen niet bidden of hopen op dingen die gebeuren moeten, maar in plaats daarvan aannemen dat het er al is.....en toestaan dat het naar hen toegetrokken wordt. Dat is Vijfde Wereld Alchemie. Sommigen van jullie leven al op die manier. Er waren wat oude beschavingen die leefden in een soortgelijke vorm als deze Vijfde Wereld gedurende korte periodes op deze planeet. Zij deden dit om de mogelijkheid voor de toekomst van de Vijfde Wereld te verankeren. Het is net alsof je niet weet hoe chocolade smaakt, hoe kun je het dan aan iemand uitleggen? De landen die jullie Atlantis noemen (het meeste daarvan rust nu onder de zee behalve Santorini in Griekenland en de Bahamas in de Caribische zee), de Peruviaanse Andes en sommige plaatsen in de Himalaya zijn enkele van die plaatsen waar de ouden de herinnering verankerden, of om het anders te zeggen, de profetie van de Vijfde Wereld leefden. Velen van jullie worden naar die plaatsen getrokken voor mysterieuze redenen. Wist je maar waarom!